for $248,900 with 2 bedrooms and 2 full baths. This 1,200 square foot condo was built in 1974. Rare find on North beach at Ocean Inlet Yacht Club. This condo is priced to provide you an opportunity to own a slice of heaven in one of the most desirable locations in New Smyrna Beach. Update to your own style and taste! This ground level unit has a direct view of the pool, boat docks and spectacular Indian river with direct access to Ponce Inlet. 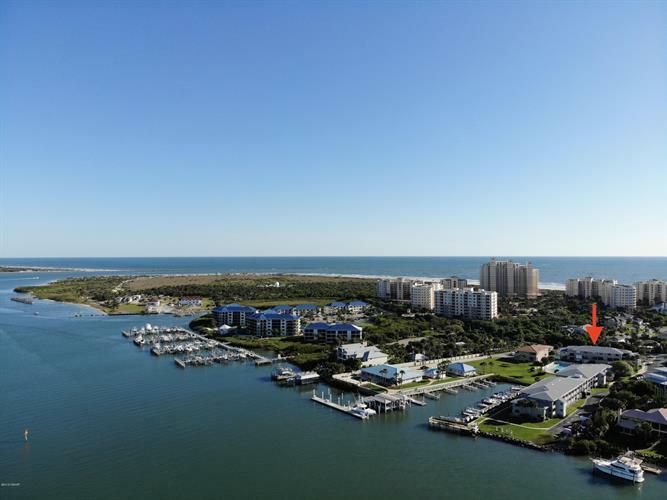 You will enjoy stunning sunsets nightly from your back patio, relaxing by the pool, watching dolphins jump and play, fishing from the brand new community dock, or sitting on the swings enjoying a beverage. Smyrna Dunes Park with dog beach, Ponce Inlet and the famous Atlantic surf beach are all within a short 6 min walk! The renovated clubhouse is a great place to host your family events with ease and in style.